VillageLab’s Consulting Team provides professional incubation and consulting services in project design and development for “communities of intent” through a whole systems design framework that integrates the social, ecological and economic dimensions – what we call Regenerative Whole Systems Design. This Whole Systems Design framework is the basis for VillageLab’s Research, Development, Demonstration, Replication & Dissemination Program (what we lovingly call R2D3). This program is VillageLab’s larger mission with our Consulting Services being an integral first step. “Utopian visions, and the social experiments they inspired, are a product of our most freely creative faculty, the human imagination. They are an expression of the universal impulse to create the new –to reshape culture and even consciousness itself”. Jessica Roemischer. 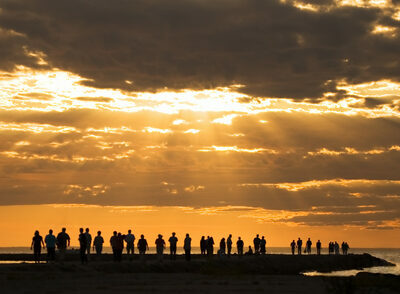 Communities of intent bring people together to support one another and create powerful, lasting relationships. Much of the essential structure and function of these communities relies on effective teamwork and collaboration. Working together – living together – is a challenge and an opportunity! While each group is unique, the tools, skills, and knowledge that help to achieve success can be drawn from the wisdom and experience of others. Communities of intent, whether newly forming or well established, benefit greatly from smart linking and rich interaction with similar or complementary groups from around the movement, opening opportunities for resource and knowledge sharing and more. Collaboration is key! One of the basic premises of community is that we are stronger, wealthier, wiser together – and this translates to larger scales as well: communities of communities become an important pattern in the Living Systems view of an emerging regenerative culture. What we are seeing at the leading edges of new economic systems design is a shift to holistic views of wealth and the appropriate currency systems which grow, sustain and share it. 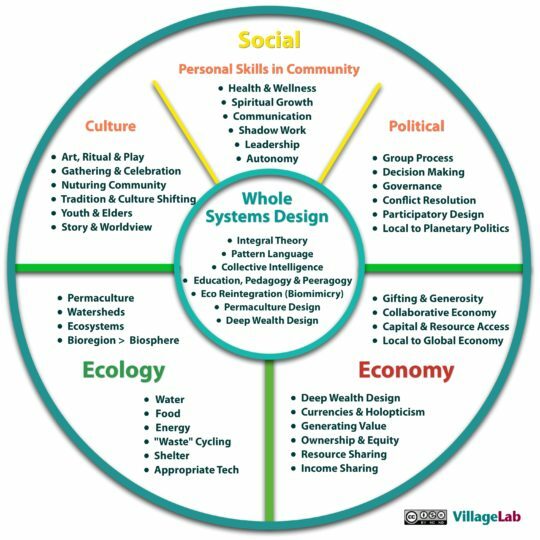 VillageLab expertise in designing and implementing systems for community economics takes this fresh approach to recognizing the true abundance and potential at the heart of all living systems. Our work turns away from oppressive extraction and capitalization mindsets to instead cultivate and weave life-giving currents that enhance the entire community organism and beyond. Sustainable ecological infrastructure is often the first issue that comes to mind for individuals and groups choosing to pursue an ethical lifestyle in community. Perhaps you can picture a cluster of resilient Earthship dwellings, or an array of sun-tracking PV panels adjacent to a fertile food forest. Is such aesthetic natural abundance within reach of anyone? There are many appropriate technology solutions to consider, and new innovative approaches always in development. VillageLab’s Core Consulting Team draws on 60 years of combined experience living and working in intentional communities. We are delighted to weave this knowledge and wisdom into a cohesive whole as we serve a wide variety of communities working to contribute to a sustainable, thriving and regenerative society. Jeff has enjoyed 36 years as a leader in intentional community design, appropriate technology, and new paradigm economics. Jeff co-founded the Ecovillage Network of the Americas and was Ecovillage Director at Sirius Ecovillage for 6 years. Jeff has served on 7 NGO Boards, founded 6 successful solar & renewable energy design & installation businesses and has visited over 60 intentional communities teaching and providing comparative whole systems design. Jeff’s passion is the design integration of the social, economic and ecological aspects of community. Ferananda is internationally recognized in collective intelligence and the next paradigm economics. The center of her work is social systems design very focused on Wisdom-Driven Organizations and Communities of purpose, place and practice. Ferananda designs experiences and facilitates processes in Europe, Mexico and the US and consults in intentional community design using an integral model she co-developed. As part of 'The Metacurrency Project' she works on currencies applications and Deep Wealth Design. Jamaica Stevens is Author and Curator of the multi-media project “ReInhabiting the Village: CoCreating our Future”. As an Organizational Design Consultant and Steward with VillageLab, Jamaica works with Regenerative frameworks and Whole Systems principles to empower people, projects and organizations to THRIVE! She is also an experienced event producer, workshop leader, group facilitator, educational program designer, community organizer, project manager, writer and life coach. She is currently the Educational Program Manager for the Lucid University and has been the Co-Founder of Protectors Alliance, Program Manager for Lucidity Courseweek, Creator of Tribal Convergence Gatherings, Co-Founder of Tribal Convergence Network, Educational Program Coordinator with the Novalis Project, Executive Producer of Awaken Visionary Leadership Summit, as well as a Contributing Producer with Lucidity and other festivals. Passionate about earth stewardship, collective evolution, village ethos and collaborative culture, Jamaica is in service to supporting the conditions for planetary flourishing and a regenerative renaissance. Keala is a whole system designer​,​ regenerative practitioner ​and permaculture teacher ​with a background in the healing arts. His rich study of permaculture and ecovillage design includes certificate programs from Findhorn Foundation to Esalen Institute and is complimented by experiential learning in co-production of multiple design courses and intensives. Keala is a co-founder of Atlan Living and Learning Center near the Columbia River Gorge in Central Cascadia, is a co-author and contributing editor of ReInhabiting the Village and is Co-Director of VillageLab’s RegenSolutions Initiative. VillageLab mission is to serve communities of place, purpose and practice. Our passion is to create together a sustainable and regenerative world. In working together our prime goal is for our clients, partners and ourselves feeling absolutely great about what each has given and received in the relationship. To accomplish these goals, we are devoted to clear communication, transparency and very clear social and contractual agreements for our work together. We have embraced a spectrum of business relationships ranging from retainers and contracts to an “up-front generosity” model to working “in the gift” designed to match our capacities with our client’s needs and values and vice versa. If you are interested in working with us and need our services, don’t let your level of financial wealth or access to resources get in the way of engaging with us. If you are interested to hear more – feel free to contact us. We look forward to establishing a working relationship that best honors the needs of all. We are preparing an awesome newsletter on 'Whole Systems Design for communities' (Economics, Environment, Social, Culture, Politics and the 'I' in community). Register to receive it. We share great content and love to engage in conversation through our Social Media channels. Follow us!